Cocktails fit for a queen: Fever-Tree stirs things up in a rocks glass. CAPSULE REPORT: The gourmet cocktail mixer arena has been heating up. While premium mixers to create fancy cocktails—appletinis and mojitos, for example—have been available for some time, now the basics—tonic water, bitter lemon, club soda and bitters—are now being given special treatment. Should you mix your Bombay Sapphire with supermarket tonic water, made with high fructose corn syrup and manufactured quinine, or does it deserve real quinine extract and cane sugar? The answer may seem obvious; but to people used to drinking the strong-flavored Canada Dry, Seagram’s and Schweppes versions, the subtle flavors of the premium mixers may come as a surprise. The drinks make nice house gifts: They’re packaged to look like they belong in the cocktails of people who like the finer things. Why spend top dollar for great spirits, and pair them with supermarket mixers? Stirrings, a pioneer in the cocktail mixers and drink rimmers (the company has everything from espressotinis to piña coladas—just add alcohol and ice), has introduced bar sodas, as well as blood-orange bitters and grenadine. 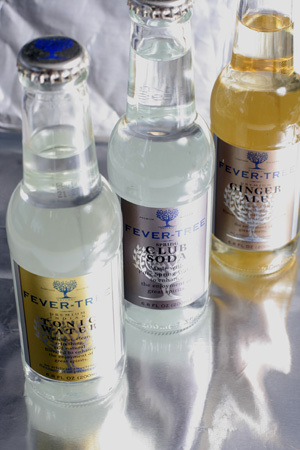 From across the pond, Fever-Tree has launched an even tonier-looking group. And one gin and tonic-drinking New York entrepreneur created Q Tonic* when he realized how much sugar there was in mainstream tonic waters. *Currently with limited distribution in New York City plus Whole Foods in Austin, Texas. Are these premium mixers worth a premium price? Yes, if you’re looking for all-natural flavor and real sugar instead of the high fructose corn syrup of supermarket brands. Yes, if you’re looking for cocktail sodas with a very light touch of flavor. If you’re using them as mixers, they certainly will let the alcohol shine through, producing a cleaner, crisper and lighter cocktail. They don’t carry the kind of flavor punch most people are used to, so those who favor sweet drinks must prepare for an adjustment. In terms of drinking these cocktail straight as soft drinks: They are very elegant, with flavors so subtle that it is like drinking fine club soda, gently-flavored. For more a more intense flavor experience, you might want to try the all-natural sodas of brands like GuS and Boylan’s. Some people may know Fever-Tree as an American psychedelic rock band of the 1960s. But the original “fever tree” is actually the cinchona, a genus of some 24 trees that grows on the slopes of the Andes Mountains. It was given its name in 1742 by the botanist Linnaeus, who named it after a Countess of Chinchon, wife of a Spanish viceroy to Peru, who contracted malaria (known “the fever”) there. In 1638, she was treated with the local remedy, made from the bark of the tree, and supposedly introduced it to Europe in 1640. The bark, which is stripped from the tree, is dried and powdered, then mixed with a liquid and drunk, includes alkaloids that are closely related to quinine but react differently in treating malaria. Cinchona bark is also known as Jesuit’s bark or Peruvian bark. 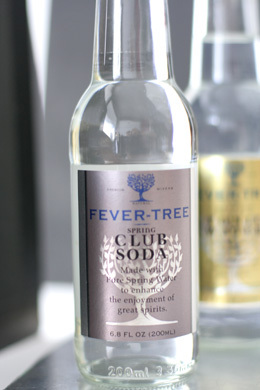 Fever-Tree Ltd., producers of premium cocktail sodas to enhance premium spirits, offers a historic tonic water (more about that in a minute) as well as bitter lemon, club soda and ginger ale. The bottles are so handsome, you can imagine them being carried in to the Queen and Prince Philip on a silver tray. The bottle looks so good in your hand, it’s as if Burberry were bottling soda. The silver and gold caps are gorgeous (silver for Spring Club Soda and Tonic Water, gold for Bitter Lemon and Ginger Ale), that some enterprising downtown jewelry artist will be making earrings and bracelets of them before long. The line is served at leading European restaurants such as Ferràn Adria’s El Bulli in Spain, and Heston Blumenthal’s The Fat Duck in England. The sodas are made of spring water, cane sugar and natural flavors, with no artificial colors or preservatives. They are made to be, according to the manufacturer, “important drinks in their own right.” The taste profile is elegant, too, although not what we expected. The club soda made from Scottish spring water is simply delicious. We hope something this good will spark a movement to making club soda from springs that don’t already have a sparkling water. If you drink a lot of club soda, this will be your Dom Perignon, making it tough to drink the supermarket brands every day. The natural sweetness of the water is noticeable, the bubbles are like the tiniest, tightest Champagne bubbles, and it is so refreshing that one 6.8 ounce bottle is just a tease to a thirsty person (a dehydrated thirsty person, not a Scotch drinker looking for a soda mixer). The rest of the line remained strong on looks, but very subtle on flavor. No doubt this is intentional, but we like a more flavor-forward profile. If one is going to add quinine or lemon to a drink, there’s a reason for that flavor instead of plain soda. Club soda from spring water. Other companies just filter tap water. Photos by Michael Steele. Thus, we found that as straight sipping beverages, the Bitter Lemon, Ginger Ale and Tonic Water were extremely elegant in flavor as well as in looks. Many people will really appreciate this style. Those who prefer more highly-seasoned foods and more complex wines might want a more flavorful mixer. As a side note, we never mix a very fine spirit, preferring to enjoy its layers of flavor undiluted. We know there are many people who don’t enjoy spirits straight, want soda with their Laphroaig, or make a gin and tonic of Old Raj. For them, Fever-Tree mixers will be only slightly intrusive. Tonic water is a carbonated soft drink flavored with quinine. It is called a “tonic” because of the medicinal effects of the quinine. It has become the fashion over the last few years for better bars to use better tonic water, seeking out specialty and artisan brands in small bottles. Some bars have imported Schweppes’ Indian Tonic Water from the U.K.: European tonic waters have a higher content of quinine and are sweetened with cane sugar, as opposed to the pariah high-fructose corn syrup (HFCS). Tonic water and other mixers from smaller bottles generally have a higher level of carbonation than the sodas that shoot from the bartender’s “gun.” One entrepreneur in New York City has created Q tonic water, using organic agave nectar as the sweetener (a four-pack costs $10). Like its competitors, Q Tonic boasts all-natural ingredients, including quinine extracted from “hand-picked Peruvian Andes tree bark.” For others who just want to avoid the HFCS, Whole Foods Markets sells tonic water in cans under its 365 house brand. Some bartenders brew their own, from cinchona bark or powder (the specialty brands use expensive isolated quinine, extracted from the bark). This beautiful bottle of tonic water falls under the first category, U.K. imports, and has such historic roots that we hate to niggle. First the roots: As demand outstripped supply for health-preserving quinine in the 1850s, the East India company tried to cultivate fever-trees in the British colonies, but seeds from trees harvested in Ecuador proved to be of a species that was relatively poor in quinine. British explorer Charles Ledger brought seeds from Peru that were planted in Africa and produced top-quality quinine. Fever-Tree Ltd. found the last of those original plantations still prospering in the heart of the war-torn Rwanda-Congo border, from which their Tonic Water and Bitter Lemon are made. The niggling: the quinine flavor is very, very light. It’s almost like lemon soda. Perhaps we suffer from having grown up on tonic waters made from synthetic quinine. 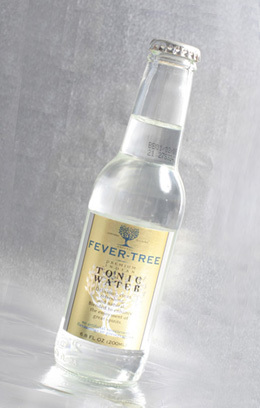 Perhaps its that Fever-Tree is not pure quinine water, but includes African marigold, Tanzanian bitter orange oil, lime oil, coriander oil and other botanicals, which dilute the professional-grade quinine and give it a more floral profile. Lovely to drink, but we want more quinine flavor. Most people with refined palates will love this tonic water. We appreciate what Fever-Tree has created; Ferràn Adria likes it so much that he made a soup palate cleanser from it. Personally, we love the flavor of quinine, and would have liked an even bigger hit of it (our ideal mixer would have more quinine and less sugar). But we recognize that most people need to be weaned away from the sweet stuff, one spoonful at a time. Flavored with fresh young (green) ginger from Ecuador, Cochin ginger from India and Nigerian ginger,—each has a different flavor and aroma—this ginger ale will be a surprise to those accustomed to commercial brands. Despite the trio of gingers, it’s a very gentle ginger ale—the subtle flavor profile matches that of the Tonic Water. We tried it in several cocktails calling for ginger ale and it mixed beautifully. As a soft drink, we personally prefer the livelier all-natural ginger ale experience of GuS or Boylan’s. Try all three and decide for yourself. This classy mixer is perhaps the most delightful of the three flavors to drink on its own, there’s nothing really bitter about this lemon (O.K., a teeny bit of bitterness—the flavor of peel—on the finish). It has 2% lemon juice plus added lemon flavors (and some quinine—not discernable) and is so refreshing that one need not add any alcohol at all. Also available at fine retailers nationwide. Prices and flavor availability are verified at publication but are subject to change. Shipping is additional. If Fever-Tree is Buckingham Palace, Stirrings is Nantucket Island—which coincidentally is where the company was founded. Its bottles are not as sleek—the bright, preppy colors of its scalloped labels are cheerleaders contrast to Fever-Tree’s fashion-model metallics. Where Fever-Tree delivers Champagne bubbles, Stirrings claims to, but doesn’t. In fact, the Stirrings labels call out to the “Champagne bubbles” inside, and to underscore the point, have tiny bubbles printed on the labels. But unless we got an anomalous batch, the bubbles were no different than any other soda. In fact, the carbonation levels seemed a bit low. 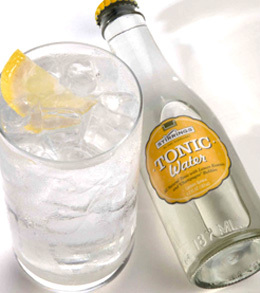 The Tonic Water is made with regular water that is triple filtered, plus cinchona extract and cane sugar. It has even less of a quinine presence than Fever-Tree’s. In a blind tasting, we never would have identified it as tonic water, but rather some ambiguous Italian soft drink. Once told what it was, we could find some quinine on the finish, but not in the front and mid-palate, where it should have been. It mixed up into a nicely sweet G&T, without any quinine action. Similarly, the bitter lemon had no lemoniness. It did have an interesting earthy flavor—something we call fresh saddle leather flavor, which we have had in other bitter lemons. There’s flavor on the finish, but ambiguous sugar elsewhere. When you mix it with gin or vodka, is becomes less apparent, and adds a sophisticated sweetness to both gin and vodka. Both are far superior to supermarket mixers, but don’t stand as well on their own as soft drinks. 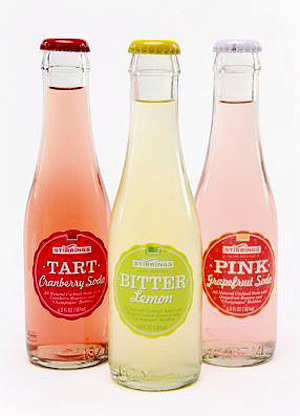 The two two particular delights are the Pink Grapefruit and Tart Cranberry Sodas. As mixers, they turn gin or vodka into instant festive cocktails—delicious any day, but especially festive on holidays requiring pink or red colors (fall, Christmas, Valentine’s Day, Independence Day, e.g.). Squeeze some lime into the Cranberry for a Fizzy Cosmo, and use the appropriate ingredients for variations on all of the cocktails requiring plain cranberry or grapefruit juice. Both the Tart Cranberry and Pink Grapefruit are very light flavor touches, as if someone put a few drops of fruit essence into club soda. Pink Grapefruit would pair especially well with food because it is so subtle a flavor. For soft drinks with more intense flavor, try GuS’s Dry Cranberry Lime and Star Ruby Grapefruit. We weren’t able to find the Club Soda, which sounds interesting, flavored with cinchona bark extract and fleur de sel French sea salt. Nor were we able to get hold of a bottle of the Ginger Ale, made with Jamaican ginger and Mexican lime juice—an interesting addition. We look forward to trying them and reporting back. For a retail store locator, visit Stirrings.com.